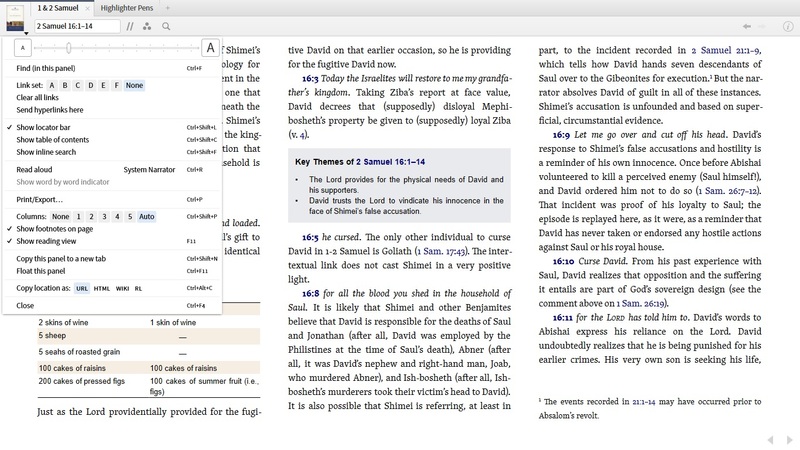 1&2 Samuel Commentary Teach the Text from Logos Bible Software. I have enjoyed the 1&2 Samuel commentary in the Teach the Text series so much that I decided to request a copy from Logos Bible Software. Logos offers many additional benefits that are not possible with a hardcopy. Because I have previously reviewed the contents of this commentary, I will focus on the benefits offered by the Logos edition. If, however, you have not yet read my review of the commentary itself, I have included it as well. The first thing that Logos allows me to do is show you the beautiful layout of this commentary. In my first review I noted that the Teach the Text series is attractively presented. In the photos that follow, you will have an opportunity to see what I mean. Every author of the Teach the Text series follows a five-point outline. I have detailed these in the review below, but here I offer a photo of the introductory pages showing the five-point layout. This photo shows the 5-point layout of the commentary. I have highlighted the heading. Logos allows you to use a highlighter pen just as you might in a hardcopy. The folder to the left of the highlighting also allows you to make comments on the portion you have highlighted. The great benefit of Logos is that it allows you to interact with the text in various ways. Logos users will be familiar with some of the advantages that I list here. First, the ability to hover your mouse over something in the text and receive immediate information is extremely helpful. For example, how many times have you seen a textual reference in parenthesis and meant to look it up but never got around to it? With Logos you can simply hover over the textual reference and see it immediately without leaving the page. The photo below not only shows this feature, (the mouse is hovered over Matt. 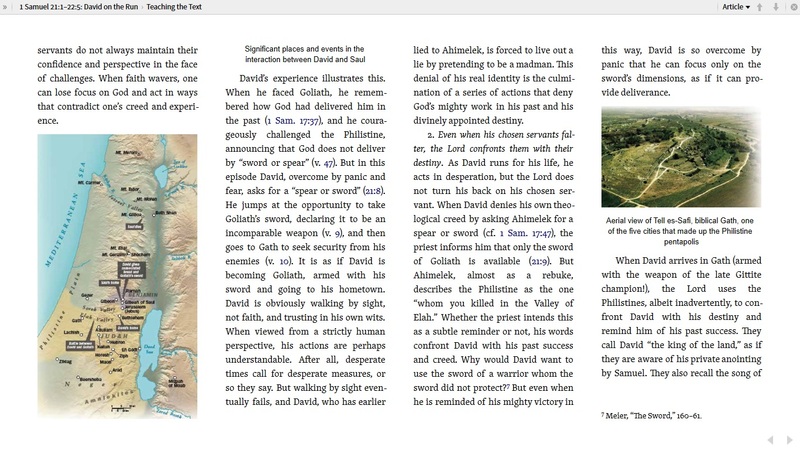 12:34–see the lower righthand corner), it also shows an example of the layout of Chisholm’s 1&2 Samuel commentary. 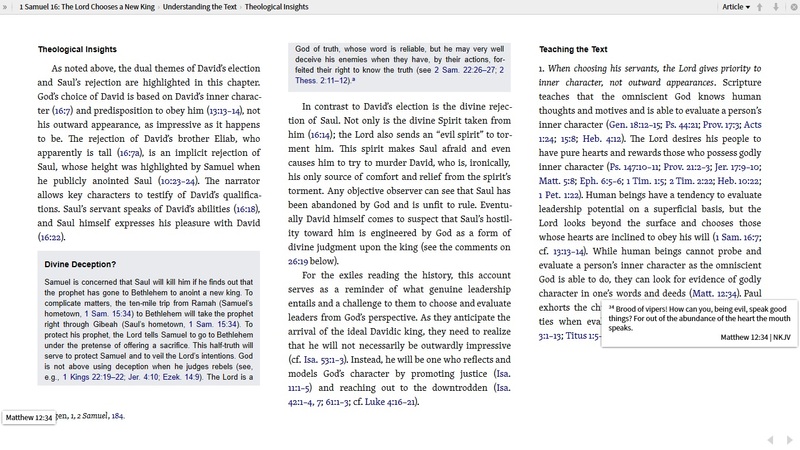 The photo shows the “Theological Insights” and “Teaching the Text” sections on 1 Samuel 16 (top of columns 1&3), while also showing another interesting feature of Chisholm’s commentary–a dialogue box that focuses on special issues (this one intriguingly entitled, “Divine Deception?”). Logos allows you to see a Scripture reference immediately simply by hovering your mouse over it. The hovering feature is also helpful when there are abbreviations in the text that you’re not sure of. Furthermore, when an author references a certain source, if you have that source in your Logos library, you can hover your mouse over it and pull up the reference to that source. This is especially helpful if the author is referring to a Hebrew word and quotes BDB (Brown, Driver, Briggs Hebrew Lexicon) as his source, or is referring to an ancient text that you may have available in your Logos library (such as Hallo and Youngers’ The Context of Scripture, which contains translations of ancient Near Eastern texts). Since the internet has become such a great source of information, modern authors will sometimes give website addresses in the footnotes. If you’re reading a hardcopy you have to jot down the reference and then open your computer to check it out. Again, it’s probably one of those things you’d like to do, but may never get around to. In Logos, it’s just a button click away! All you need to do is click on the web address and Logos immediately takes you there! There is a dropdown menu in Logos that provides a number of advantages including a special “reading view,” which is the view I have been using for these photos. A really nice feature I have recently discovered is the “read aloud” option (see the menu on the left and go halfway down). If you’re tired of reading, or prefer someone else to read to you, you can click on this function and Logos will read the text to you! You can also click on “show table of contents” in this panel and immediately go to any part of the book. The following photo shows the drop down panel with these and other options. I have also chosen this page from Chisholm’s Samuel commentary because it illustrates the verse by verse commentary section, it shows an example of a chart (partially blocked by the drop down panel), and it shows an example of the “Key themes” box which summarizes in a few words the important ideas of the text under consideration. Note the drop down panel in the left column which gives the Logos reader many options. Besides highlighting text (mentioned above), Logos also allows you to copy text. 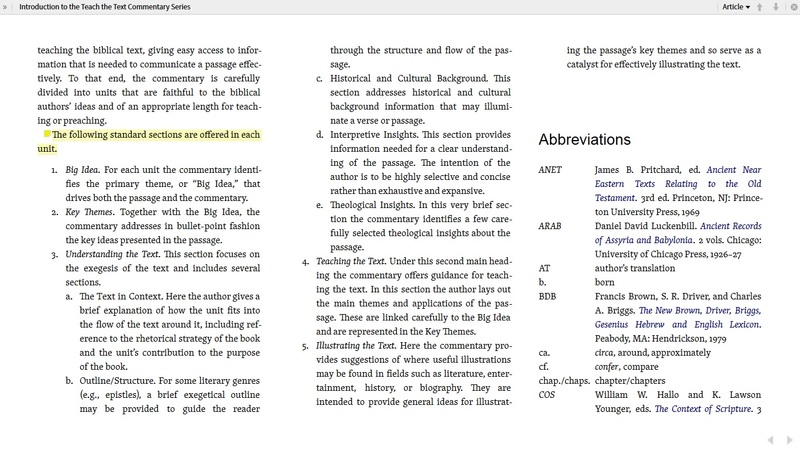 So if you are making notes for a sermon or Bible study, or you are writing an article, all you have to do is use your cursor to highlight the text, right click, and click copy. Logos even supplies the footnote so you don’t have to remember where you got the information from. This is especially convenient if you’re writing a paper because you don’t have to go to the trouble to compose the footnote! These are just a few of the wonderful features of reading in Logos. I’m sure as time goes on, I will discover others. As I promised, below is a review of Chisholm’s Samuel commentary. If you haven’t previously read it, please continue in order to gain a fuller appreciation of this book. Chisholm begins his 1&2 Samuel commentary with a brief 7-page introduction. He summarizes these books by noting the three main characters (Samuel, Saul, and David) and by stating, “David is the focal point of the story” (p.1). Saul acts as a foil to David, while “Samuel’s support of David becomes foundational to the narrator’s defense of David” (pp. 1-2). The high point of the book is the Lord’s covenant with David, securing his dynasty and proving faithful even in the midst of David’s sin. Chisholm divides 1&2 Samuel into 7 sections based on “its major plot movements, revolving around the theme of kingship” (p. 4). His outline is as follows: 1) Prelude to Kingship (1 Sam. 1-7); 2) Kingship inaugurated (1 Sam. 8-12); 3) Kingship Fails (1 Sam. 13-15); 4) Kingship in Limbo (1 Sam. 16-31); 5) Kingship Revived (2 Sam. 1-10); 6) Kingship Threatened and Preserved (2 Sam. 11-20); and 7) Epilogue (2 Sam. 21-24). One potential weakness is that this outline is not clearly delineated in the commentary that follows. Perhaps Chisholm’s reason for ignoring this is because he does not find “clear-cut structural markers” in the text (p. 4), but sees the divisions above as related to plot development. Perhaps the greatest challenge in writing a commentary of this kind is providing illustrations for the text. This is certainly a subjective task. Certain illustrations will ring true with some, while others will find them unhelpful. In an interview I conducted with Chisholm (click on link above), I discovered that this section was added by the editors, not by Chisholm himself. While I would not endorse the use of every illustration suggested in this commentary, I do believe a sufficient job has been done. The editors themselves point out that this section of the commentary is intended to provide “general ideas” and to “serve as a catalyst for effectively illustrating the text” (p. xii). 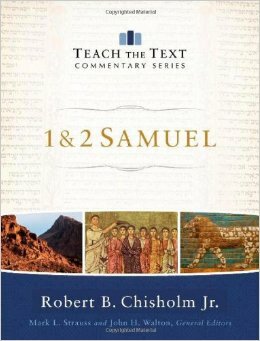 In conclusion, Chisholm’s 1&2 Samuel commentary achieves the aims of this series admirably. He is a scholar of high caliber and is a well-established expert on the entire corpus of the Former Prophets. Pastors, students, and others wanting to become grounded in the message of 1&2 Samuel will benefit greatly from this commentary. I used it for my own 1&2 Samuel class this past semester and will continue to do so in the future. I heartily recommend it to others. Purchase Robert Chisholm’s 1&2 Samuel Commentary from Logos Bible Software by clicking on this link.